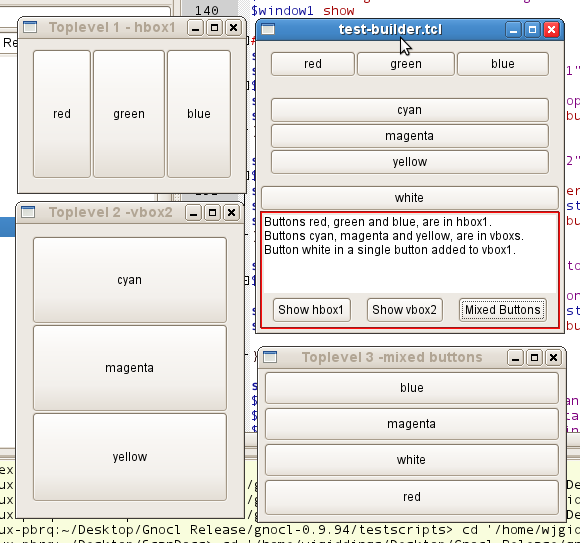 Gnocl -the Tcl/Gtk Bindings: Builder -packing specific widgets -DONE! Completed this section of the code. It works well and lots of error trapping. In fact this would account for about 95% of the code for the options. There are other ways that this could be done within a script, builder created widgets should be given aliases and these can than be manipulated in the usual way. What is good here though, is the idea of creating widget instances. With the pure scripting route only one set of widgets are built. 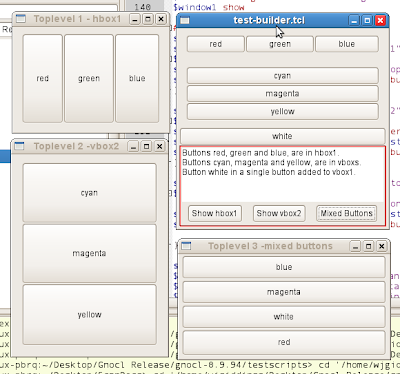 Using the builder route, multiple instances of widgets from a XML description file could be used. Keeping track of them, however, is a different matter!